Orioles rookie phenom lefty Zach Britton had his best outing to date (which is saying something) last night, pitching nine innings of 3-hit shutout ball. Britton issued zero walks and had five strikeouts in his dazzling performance. So, complete game shutout right? The O’s bats were also stifled by Seattle lefty Jason Vargas, who threw nine scoreless to match Britton. Two pitchers both pitching 9 scoreless innings? Quite a memorable night at the yard. It was just the third time that had happened in MLB since 2000. It was a shame that the Birds were unable to get Britton the W, which would have been his sixth of the young season, but at least they were able to come away with the win at all. Jim Johnson allowed the Mariners to put up the game’s first run in the top of the 12th, and it looked like the O’s were going to completely waste Britton’s outing. However, just like Tuesday night, all it took was falling behind – and Seattle bringing in closer Brandon League – to wake up the Birds’ bats. Helped along by back-to-back HBP’s from League issued to Vlad Guerrero and Adam Jones, the O’s loaded the bases with none out. Matt Wieters scorched a liner right at the Seattle shortstop, just missing his second walk-off in three nights. J.J. Hardy would not be denied though, smacking one right back up the middle, past the M’s drawn-in infield and scoring Derrek Lee and Jake Fox. Britton remains at 5-2, but his 2.42 ERA and 52.0 innings pitched (8 starts) are both tops on the team. 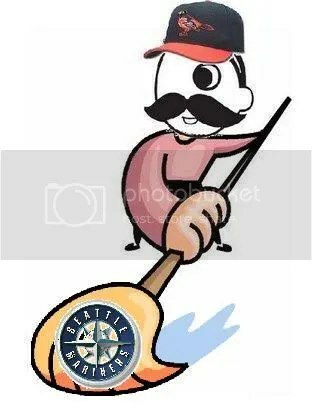 Though they managed only six runs combined the last two nights, the O’s pulled off their first home sweep of Seattle since 2005. The series gave us two of the stranger games we are likely to see all season, but the good news is that the Birds came out on the winning end of each. The O’s (17-19) can get back to .500 if they can extend their winning streak to five games. They begin a weekend series with Tampa (who they are playing for the third time already, and still have yet to play Toronto – stupid) as Jeremy vs. Jeremy (Guthrie vs. Hellickson) is featured for the second time in less than a week. If Guthrie wants to keep up with Britton (at least on the IP scale), he’ll need to pitch 8+ innings – this is Guthrie’s 8th start, and he has pitched 44.0 innings so far. This entry was posted on May 13, 2011 at 11:28 am and is filed under Orioles. You can follow any responses to this entry through the RSS 2.0 feed. You can skip to the end and leave a response. Pinging is currently not allowed.